In an early phase of an SharePoint project, it is important to find a consensus with a customer on what matters the most in a specification. After all, quite a heap of mental playload is probably occupying the cognitive landscape of the customer representatives. They usually are full of ideas, wishes, needs, sales stories, feature lists, and thoughts about the future system. This all is the fuel that makes the project run, but unfortunately the material at hand has not been structured in any systematic way. The participants might not be able to articulate their needs and opinions in a way that would enable the project team to extract the needs and negotiate an acceptable specification overnight. In order to give an overall view to the work ahead, I usually draw something like the diagram below. One cannot stress the importance of content enough. That is the number one element of an intranet project. If there is no content, there is no need to have an intranet. A general idea of what the system actually contains. It can be texts, pictures, documents, videos, sounds (heck, probably even smells or tactile responses in the next version) of something. Just a vague idea of putting documents in an intranet is not an idea specific enough. An idea of putting documents describing corporate code of conduct is a much better idea. Having a sense of what this something is a starting point for the discussions. After having an idea of this – or more like a bunch of ideas, the end user must be able to navigate. Navigation is something people understand from web, and SharePoint offers a couple of mechanisms for doing it. At this point showing a couple screen shots from actual systems might be a good idea. Make sure that you include the idea of having a relative left navigation – and do remember to say a couple of nice words about the bread crumb. Oh, and do keep reading the article. 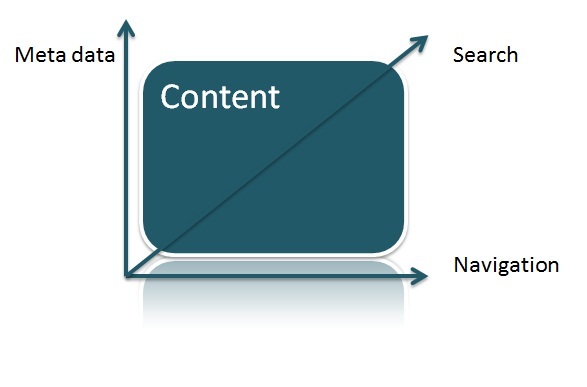 Basically search is the mechanism for finding content independent from navigation or meta data. It is a new direction to go for in the search of content – and on the other hand it is interconnected and entwined to both navigation and meta data. The stuff that gets found resides somewhere in the navigational structure and it has at least the system generated meta data. SharePoint has a nifty feature, that allows the users to first navigate somewhere, and then make a search below the current site. If the search center has been properly configured, users might combine this search with certain meta data through using managed properties. All this leads to more details regarding to each of the dimensios presented in this posting. Experience has shown, that it is a good idea to have a shared point of reference – just to remaind the team about the big picture.